Good Quality battery plus a 4 year warranty which Is reassuring. 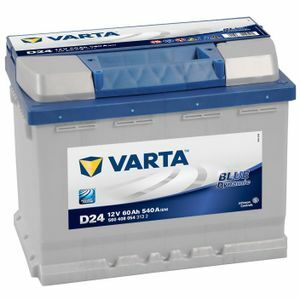 Very competitive price for a good quality Varta battery. Delivered quickly and efficiently with good communication. Would definitely buy from them again. Good value, as described and promptly delivered. The new battery was delivered as advised and I was kept informed throughout. The item was very well packed to protect it from transit damage. The battery seems to work well initially as should be expected. Seems superb, will it last? Excellent service, the battery was promptly dispatched, the courier arrived at the time he said he would and the battery was carefully packaged so as to arrive in perfect condition. I shall recommend Tayna batteries to friends and colleagues. Second battery I've ordered from Tayna (the first several years ago). Once again, good clear advice on the website, very competitive prices and super fast delivery. Very happy with the Varta battery - replaced a lower spec OEM battery on a Mazda3 and less than half the price quoted by the RAC man!! Great battery at a great price. Excellent purchase from start to finish. Have used before and will use again. Brilliant service & a great product ! Competitive price well packaged and fast delivery. Thank you. Des super produits, un excellent rapport qualité/prix, une livraison en Corse, un emballage au top. Vous êtes les meilleurs. OK. The same of original one. I've started the old one with a battery lithium ion booster, good. With the actual temp this battery work fine. The new one stay in my stock before the next winter. Thanks for the perfect service ! Battery received the next day, well packed and promptly delivered. I fitted it to my car and it works well.